This spring, Richtenburg presents a new collection for the ladies, which offers a lot. As always, the watch manufacturer has devoted itself to its new creations with a great deal of attention to detail. Each of the four models of the Diamond Line is offered in various versions – in stainless steel or with PVD coating and with different colored dials. 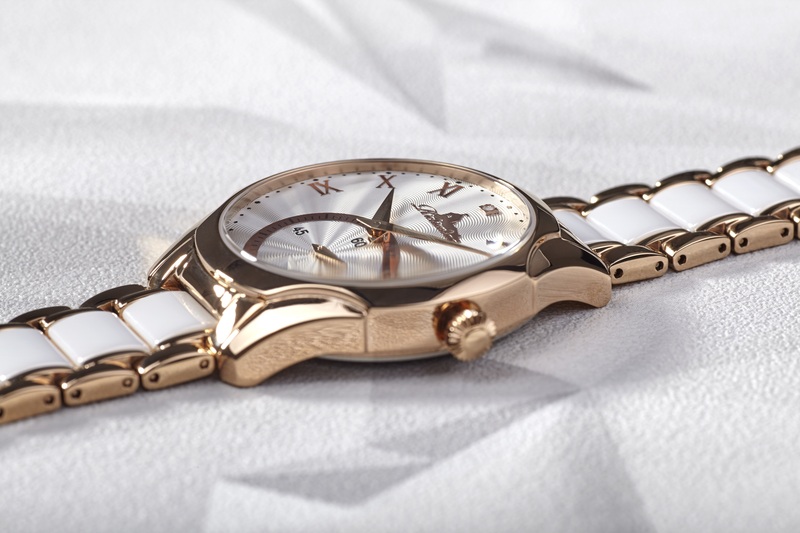 The Belana is a ladies’ watch with a classic style. Richtenburg has given it a modern look with a large second and lance-shaped hands. In order to provide sufficient space for the huge subdial, Richtenburg has placed the Roman numerals only in the upper half of the dial and the numeral at twelve o’clock was replaced by a diamond. Richtenburg provides six different versions of the Belana, including two trendy bi-coloured versions; with a light or dark dial and matching ceramic inlays in the bracelet. The case with the elegantly integrated lugs has a diameter of 36 mm and is water resistant to 5 atm. The Richtenburg Gesa is a simple three-hand watch with a date window. 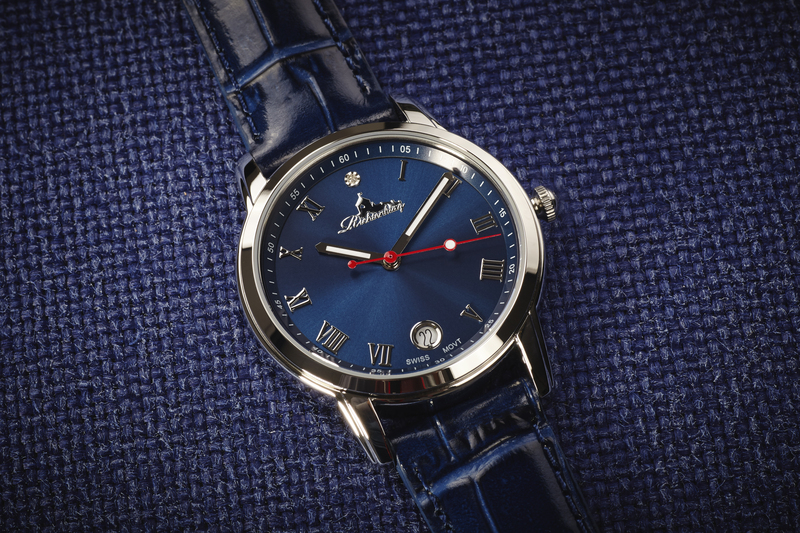 The dial is dominated by the applied Roman numerals and a red seconds hand. A diamond sits at twelve o’clock. In order to guarantee easy readability, Richtenburg has equipped the hands with luminous material. The Gesa comes in a case with a diameter of 36 mm and a water resistance of 5 atm. Richtenburg offers five different versions of the Gesa; all equipped with a leather strap, elegant and extremely versatile. The Richtenburg Innessa is a model for the more unusual taste. This watch also displays hours, minutes, seconds and a date at six o’clock. 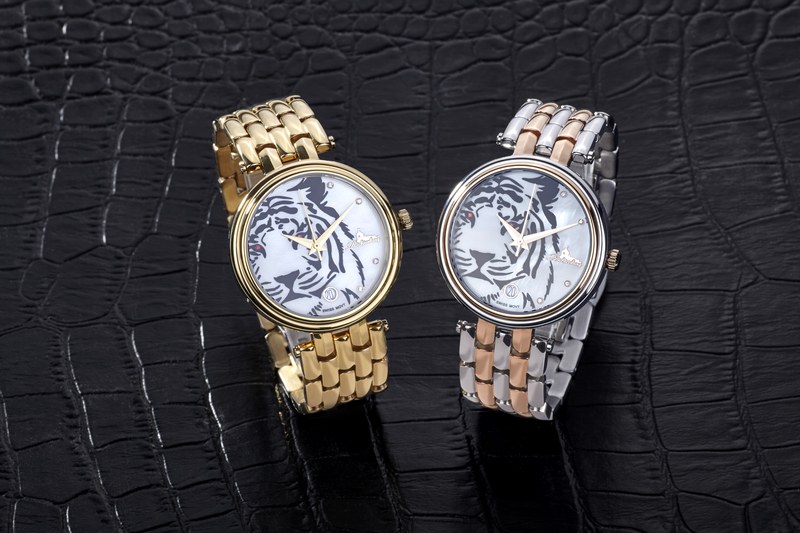 The right side of the dial features four diamond hour-markers and the large company logo, while the rest of the dial is dominated by a stylized tiger head with piercing red eyes. The Innessa has a diameter of 36 mm. You can choose between a stainless steel version with gold or pink gold coating and two bi-colour models. The last model of the Richtenburg Diamond Line is the slim Vivana. This watch is for the more playful among us. It comes with stars and a glittering crescent moon on the dial, which together with the leather straps form a colorful unit. The Vivana also features a diamond at the twelve o’clock position. The small case measures only 28 mm in diameter. Richtenburg offers six different versions of this wristwatch. All models of the Richtenburg Diamond Line are powered by a Swiss quartz movement. With this new collection Richtenburg has combined the best of all worlds. The Swiss movement is running smooth and reliable, while the watches remain affordable and meet every taste due to the multitude of variants offered. Ah, with one of its newest watches, Patek Philippe seduces all the ladies out there who want a beautiful, luxurious watch that simultaneously satisfies their needs for technical excellence. As early as 2009 the manufacturer introduced a chronograph exclusively for feminine wrists. It was the debut of a classic manufacture-made chronograph movement (column wheel, horizontal clutch, manual winding) that had been developed entirely in-house. 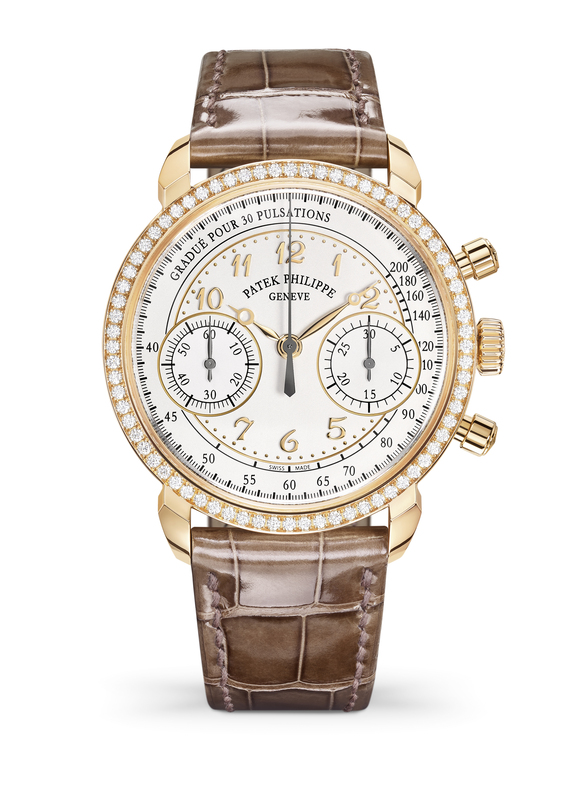 That was also expressed by the name of the watch: Ladies First Chronograph Ref. 7071, built until 2016. And now, the Genevan manufacture is enriching its collection with a new, captivating model. The new chronograph Ref. 7150/250R-001 is a technically sophisticated watch with a totally new face. The cushion-shaped case has been replaced with an elegant, round rose-gold case with a diameter of 38 mm featuring a bezel set with 72 diamonds. Its timelessly sleek design is emphasized by refined vintage looking details such as the fluted and curved lugs, the round chronograph pushers with guilloched faces, and the cambered sapphire-crystal “box” glass. The case is water-resistant up to 3 bar. The silvery opaline dial also combines a contemporary style with classic aesthetics, showcasing sculpted Breguet hour and minute hands in rose gold and a display layout that makes it eminently legible. At 3.30 you’ll find the 30-minute-counter and the running seconds is placed at 9.30. The pulsometer scale of the new model pays tribute to the tradition of classic chronographs that can measure the cadence of an active lifestyle or slightly increased heart rate of its proud owner. The compact case accommodates the manually winding calibre CH 29-535 PS movement with an instantaneous 30-minute counter. Patek Philippe has crowned its classic architecture with six patented innovations and its lavish finissage can be admired through the box-type sapphire-crystal case back that is slightly chamfered to echo the profil of the rear bezel. The movement works with 28.800 vph and boasts a power reserve of 65 hours. The Ref. 7150/250R-001 is worn on a shiny mink gray alligator leather strap. Its rose gold buckle is encrusted with 27 diamonds. Glashütte Original celebrated on the International Day of the Kiss, July 6, 2018, the magic of love and passion. 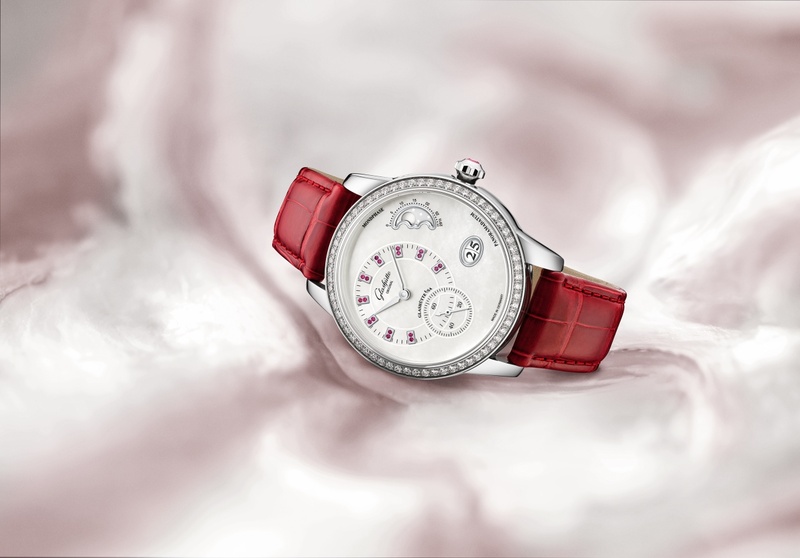 With a special limited edition, that truly comes from the heart, a beautiful women’s watch. Studded with diamonds and rubies, the PanoMatic Luna proudly wears the colour of love, permitting this mechanical ladies watch to give its classic moon phase display a new, exceptionally enticing appearance. The dial of the new PanoMatic Luna unites two romantic elements in an elegant composition. On the background of a white mother-of-pearl dial, the softly curved moon in relief and the silver-coloured, starry night sky reveal a poetry all their own. At 2 o’clock, one finds the vaulted opening of the moon phase display. The curve of the moon is the product of great manual skill and attentive diamond milling in the watchmaker’s own dial manufactory in Pforzheim, Germany. This spectacle of the changing crescent moon is complemented by 18 ruby indexes, which offer luminous red reflections on the opposite of the dial, and serve as a frame for the off-centre hour and minute display. They are positioned together with the small seconds – in classic Pano style – along a vertical axis in the left half of the dial, while the moon phase display and characteristic Glashütte Original Panorama Datum adorn the right side. What, without the brilliance of the stars, would a romantic night sky be? The bezel on the new PanoMatic Luna is set with 64 brillant-cut diamonds that reflect light with every movement. They form a glamorous frame for the round, 39.4 mm stainless steel case, whose crown is adorned on the right side by a ruby. Sapphire crystal, antireflective on both sides, assures optimal views from the dial side. Ticking within the PanoMatic Luna is the manufactory’s own calibre 90-12 automatic movement, which can be admired through the sapphire crystal case back. The latter opens up the view to the refined decorations on the heart of the watch, and to the coveted duplex swan-neck fine adjustment from Glashütte Original. 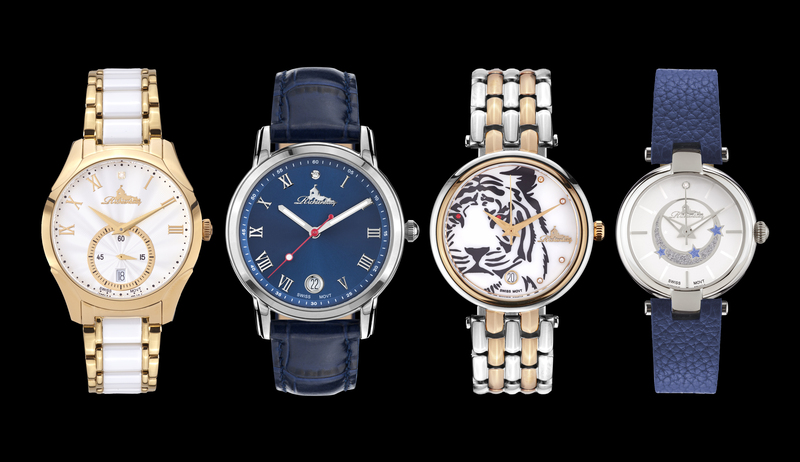 A great many other traditional elements of Glashütte watchmaking offer irrefutable proof of the origin of the watch, among the the three-quarter plate and characteristic Glashütte decorative finishes. 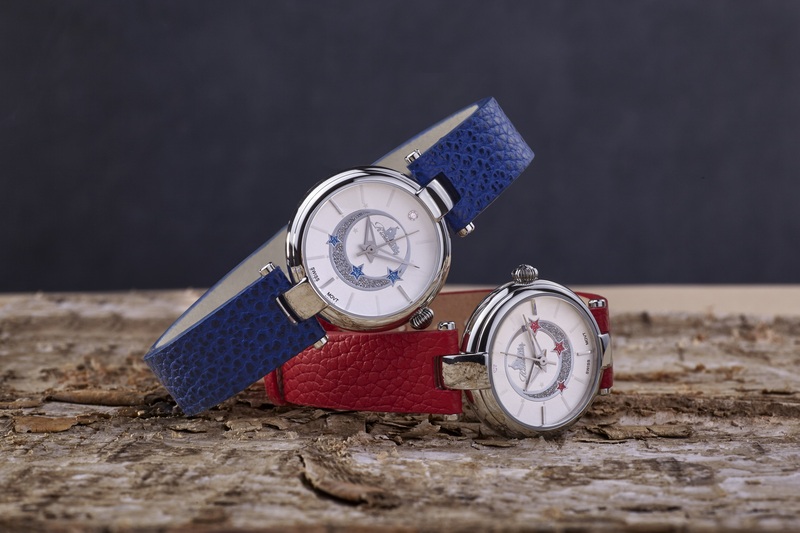 The watch is held in place on the wrist by a radiant red Louisiana alligator leather strap, which together with a pin buckle ensures a secure and stylish fit. As mentioned earlier, this PanoMatic Lunar is a limited edition of only 50 pieces. Today we look at an extraordinary ladies watch; a timepiece imbued with the spirit of the jeweler’s craft – the new Jaquet Droz Lady 8 Flower. Minimalist and richly ornate by turns, the Lady 8 and its distinctive undulating silhouette have made their marks as touchstones of femininity, elegance and watchmaking refinement. The Lady 8 Flower, a fusion of the arts and crafts Jaquet Droz is known to master, is made up of two superimposed circles creating a figure of eight. The eight is an emblematic number for the brand and a symbol of harmony, perfection and infinity. 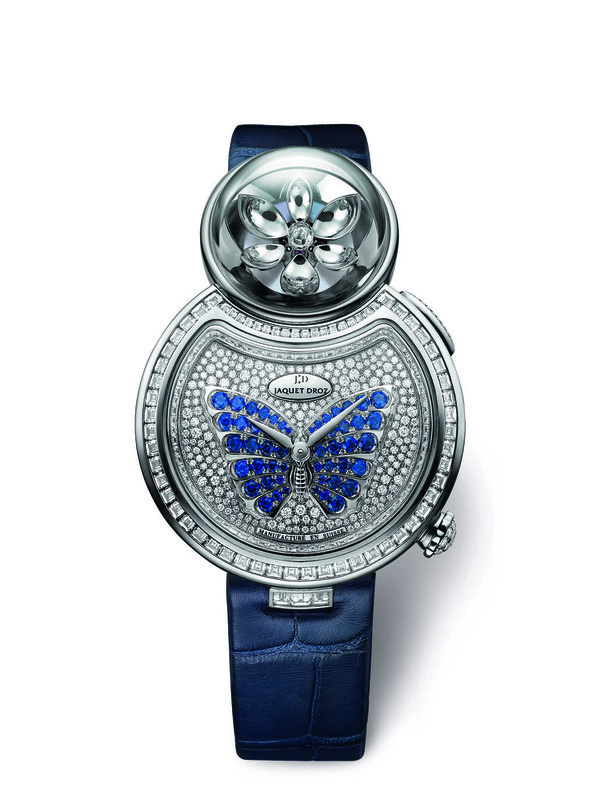 The lower circle features a delicate butterfly, its wings outstretched. Two versions are available: one with the butterfly’s wings painted and engraved in translucent red enamel on a guilloché background; the other, incorporating jewels, features a butterfly set with blue sapphires and portrait against snow-set diamonds. The upper circle reveals a lotus flower under a sapphire crystal dome. Representing serenity and poetry, and sacret to many Asian cultures, the flower has been crafted with the utmost care. Each petal is individually enameled or engraved to give its back a perfect satin finish. The watch shows only hours and minutes. As a mysterious bud or fully opened jewel-like bloom, this animation is not simply a pure vision of naturalistic and poetic beauty. By pressing a push-button the lotus flower opens, revealing its diamond heart. For Jaquet Droz, the timepiece also presented a new technical challenge: accommodating the two mechanisms, the watch’s and the automaton’s – within a 35 mm diameter case, while ensuring one never interferes with the other. The Lady 8 Flower is powered by a mechanical movement which beats with 21,600 v/ph and provides a power reserve of 38 hours. 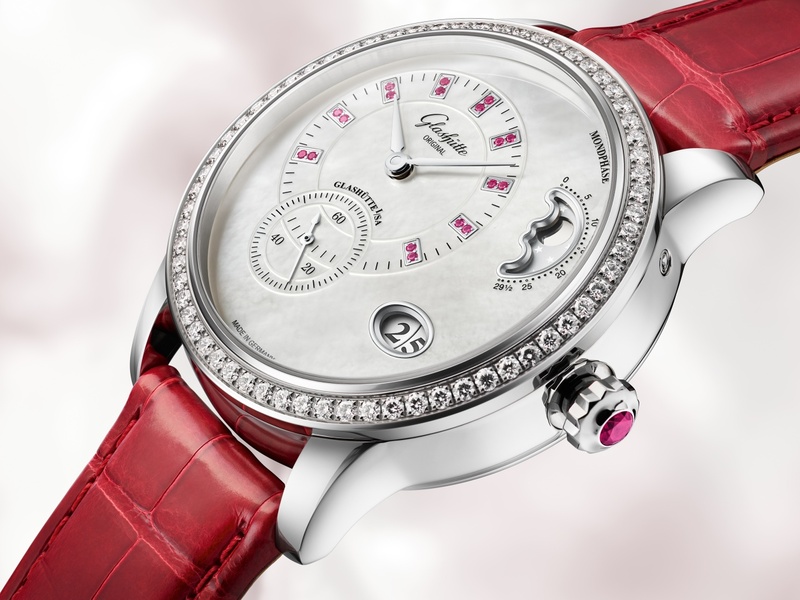 The case comes with brilliant cut diamonds either in red or white gold and water-resistant up to 38 hours. Jaquet Droz limited both versions; the red gold one to 28 pieces, the white gold Lady 8 Flower to 8 pieces. A watchmaking and style revolution at its launch in 1977, the Bulgari Bulgari watch has since become a reference model. A sign of recognition among ladies of Italian high society in the late 1970s, it has since returned to the forefront on their daughters’ wrists – to the point of becoming a style factor and a rallying point for a new generation of young women. 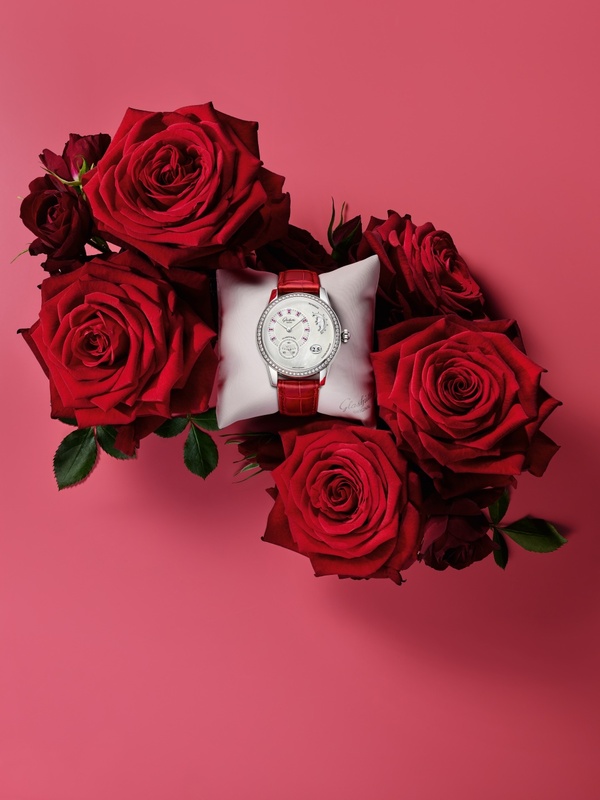 Bulgari is now offering them an even more special treat with a dedicated feminine version of the Bulgari Bulgari watch, enabling them to enliven every outfit with a splash of colour. High fashion meets contemporary design in the new Bulgari Bulgari Lady. Its singularity lies as much in its style imbued with a timeless architecture recalling the columns of Ancient Rome, as in its extremely current, lively appeal, making it a fashion accessory as well as an up to date timepiece. It comes in three sizes – 26, 33 and 37mm in diameter – fitted with alligator leather straps in vivid colours inspired by the stones for which Bulgari is known. Each strap is easily interchangeable so as to match every style and meet every expectation. 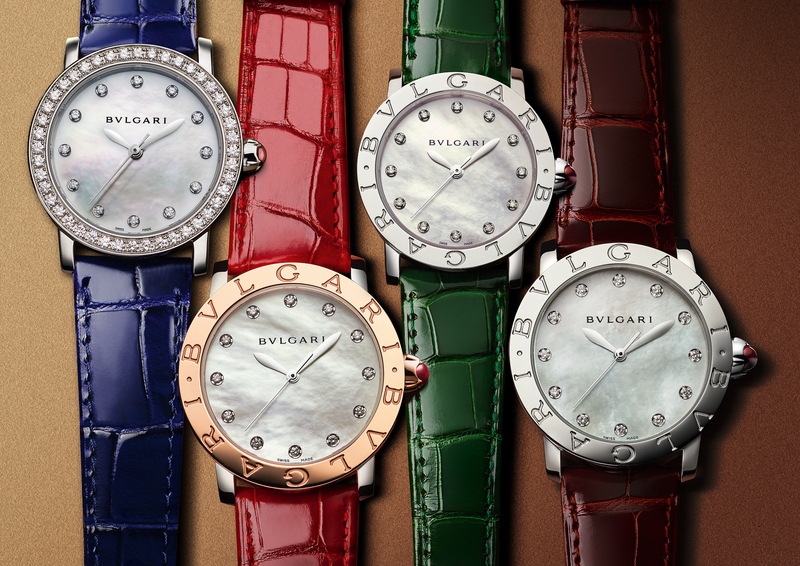 All dials in the Bulgari Bulgari Lady series are white mother of pearl or sunburst satin-brushed brown lacquered. Every one of them uses diamond hour markers. Simple – yet sophisticated – the cases are available in steel, pink gold/steel and pink gold versions. Several dial colour variations, and a version with a gemset bezel round off the many possibilities of adorning the wearer’s day. The cases are water-resistant up to 30 metre and all bezels – except the stone-stubbed one – are endowed with the characteristic bulgari lettering. The crown is engraved with the double brand logo and set with a pink stone cabochon. The new Bulgari Bulgari naturally adopts the purest watchmaking principles by enabling simple and accurate reading of the hours, minutes and seconds. The 33 and 37 mm watches are powered by a mechanical automatic movement, the calibre B77 which also provides a 42-hour power reserve. 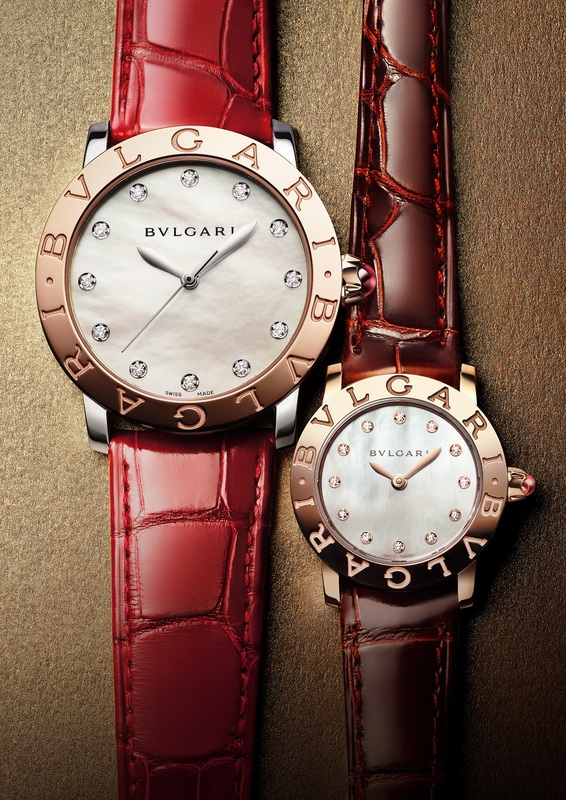 For the 26mm version, Bulgari uses a quartz movement. The result is a playful and joyful way of approaching feminine watchmaking, endowed with a fresh appeal that is both charmingly elegant and unmistakably Italian. The Malte collection from Vacheron Constantin with its emblematic barrel shape gets two new members. The pink gold creations are joining this collection epitomising a blend of distinctive presence and understatement. This interpretation of the Malte Tourbillon Openworked reveals its airy geometry playing with light and shade. In 2014, Vacheron Constantin created Caliber 2780 SQ – a barrel-shaped caliber that was also skeletonised – beating at the heart of a Malte Tourbillon Openworked in a platinum case. 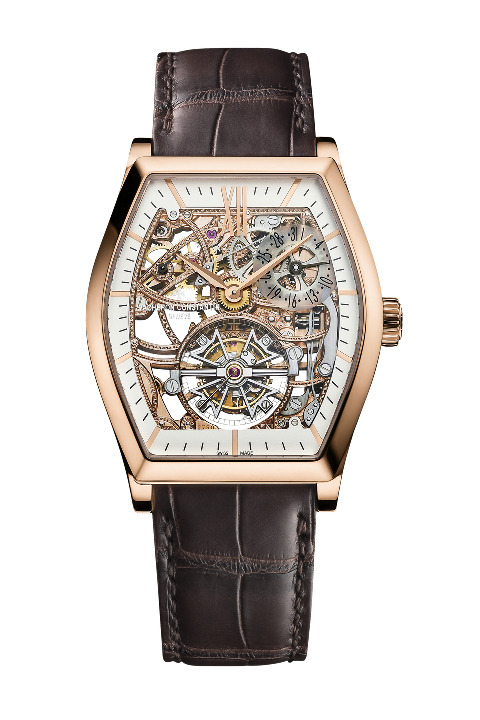 The collection is now joined by a Malte Tourbillon Openworked model with a pink gold case. Firmly rooted in the Vacheron Constantin aesthetic heritage since 1912, the tonneau shape is interpreted in the Malte collection through a range of creations. These models feature a distinctively curved design, contemporary lines and an understated display. This curved case middle perfectly moulding the shape of the wrist symbolises the Malte collection and its two new references. It measures 38 x 48,2 mm and is water-resistant up to 3 bar. Inside the case lays an entirely openworked and hand-engraved barrel-shaped tourbillon movement. Alternating shadow and light effects enable the Vacheron Constantin Caliber 2790 SQ to reveal an original architectural decor playing with geometrical shapes. The hand-engraved three-dimensional mosaic is enhanced by a Maltese cross-shaped tourbillon. Around 540 hours of workmanship (from the development of the caliber to the manual finishing of each of its 246 components) are required to achieve the balance between a tourbillon mechanism and the openworked aesthetic. 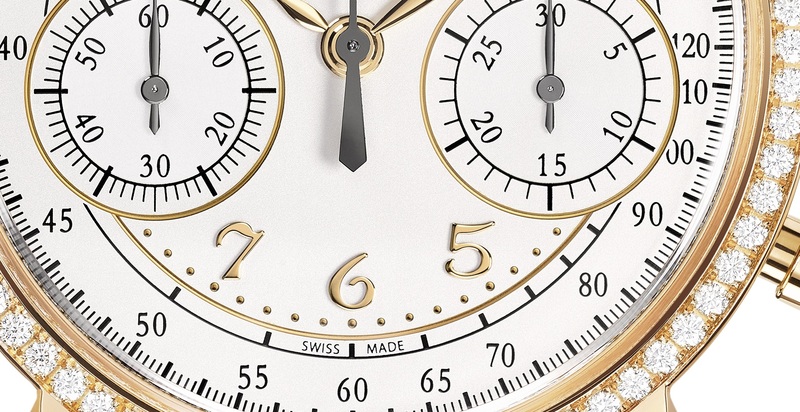 Coated in pink gold, this mechanism powering indications of the hours, minutes, seconds, date and power reserve, appears through a transparent sapphire dial rimmed by a silver-toned ring and punctuated by 11 baton-type hour-markers as well as an applied Roman (XII) numeral in pink gold. The curved shape and the inherent style of this watch is complemented by an alligator leather brown strap secured by a folding clasp. Mr. Jones is known to design really unusual watches for both, men and women and the King and Queen are no exception. 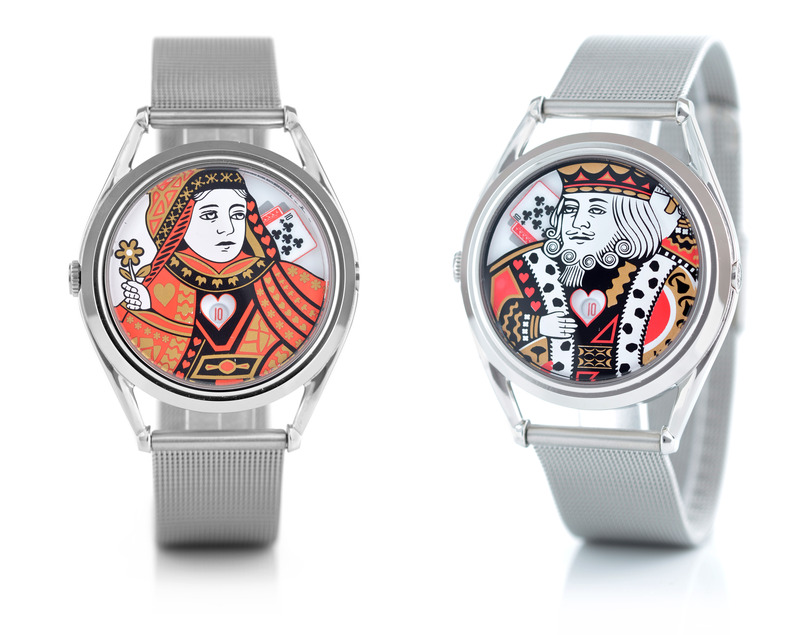 These watches are two halves of a pair of watches based on the classic playing card characters of the King and Queen of Hearts. 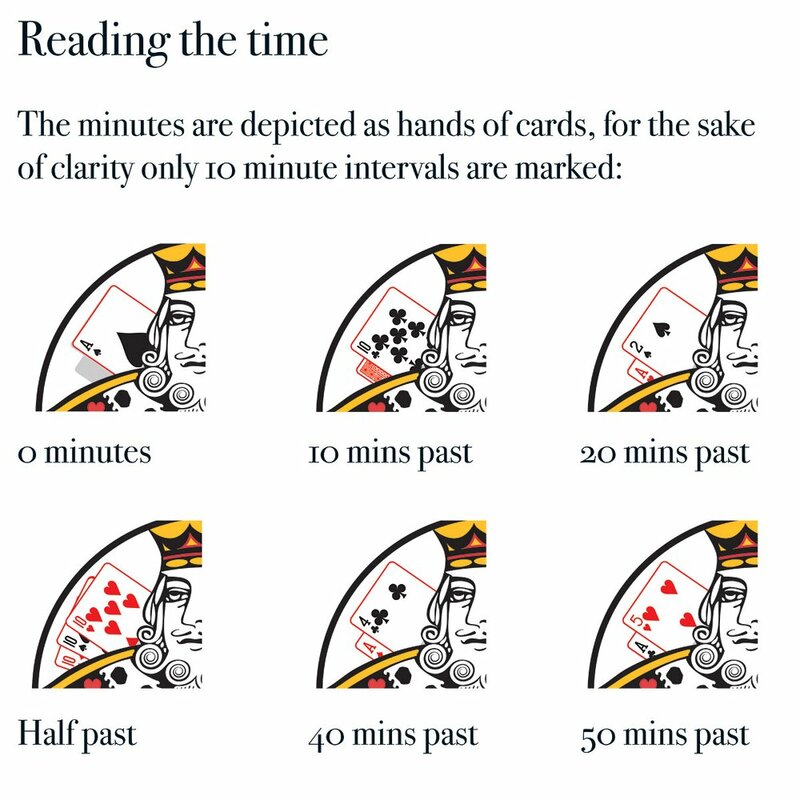 The watches feature hands of cards to depict the minutes while the hours are shown at the royal breast in form of a “jumping hour”. The use of the playing cards symbolises the transitory nature of fortune – lucky streaks, while always welcome, are only as short lived as those runs of bad luck. The watch is a gentle reminder to keep your cards close to your chest, but to be bold and go all-in when fate has dealt you a winning hand. The cases of this watches are made from polished stainless steel, coming in the typical shape of all the watches of Mr. Jones. They are 37 mm in diameter. Every case houses an automatic mechanical movement and is water resistant up to 5 ATM. Every watch comes on a woven stainless steel strap. The watches are produced in the London workshop of Mr. Jones. All components are printed by hand before assembled and regulated also by hand. 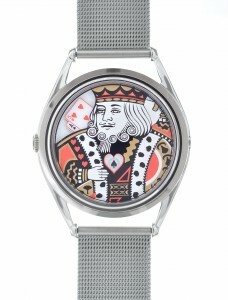 Retail price for the King and Queen watches is £195 a piece and can be purchased online here. 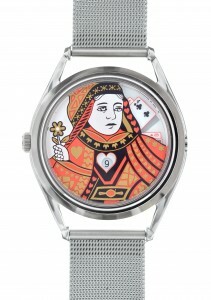 The King and Queen are limited editions; there will be only 100 pieces available of every watch. The system which displays the minutes sounds a little complicated, and maybe it takes a little while to get used to the system. But one can imagine this a little price to pay for wearing such a fun timepiece.